Owning a historic home is unlike any other homeownership experience. While historic homes require a great deal of maintenance and care, for the right owners, restoring and preserving a historic home can provide ultimate satisfaction and pride of ownership. These tips on preserving your historic home will help ensure that your property maintains its value and beauty for years to come. If you're like many Connecticut homeowners, you're probably seeking new ways to add more home storage to your property. Smart home storage ideas reduce clutter and makes your home seem more spacious. Custom storage solutions also help homeowners stay more organized. These remodeling projects will increase your home's storage capacity in permanent, beautiful ways. These projects also add character to your home, increase its resale value and add to the visual appeal of your house. With a rich history, skilled and educated workforce, and abundant natural beauty, Connecticut has a great deal to offer its residents, business owners, and aspiring entrepreneurs. But where exactly should your home or business plant its roots? Connecticut offers the picture perfect surroundings for the holiday season. From Thanksgiving through New Years, you are surrounded by natural beauty that adds to the festivities. Whether you are planning large holiday parties, or quiet celebrations at home, a remodeling project can help you and your family meet your entertaining needs. Raise Your Property Value with These 5 Remodeling Projects! Remodeling can be incredibly satisfying, especially when your remodel improves your property value and offers a return on your investment when it's time to sell. If you're thinking about selling within the next five years, these home remodeling projects can boost your home property value, while also improving your quality of life. Hurricanes don't always make landfall in the state of Connecticut, but when they do the aftermath can be devastating to homeowners and business owners alike. The following is an excerpt from our new remodeling guide, “Remodeling 101: Planning for Hurricane Season in Connecticut” . Get the full version FREE by clicking here or clicking the banner below. With the economy in a slow recovery, many homeowners are struggling with the decision to remodel or move. Should you remodel your current property into your dream home or go in search of it elsewhere? 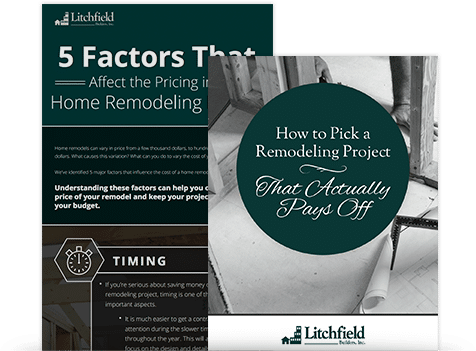 While there are advantages and disadvantages to both, we've listed four big reasons that many homeowners choose to remodel their Connecticut home over selling. Have you ever walked into a historic property and been blown away by the custom woodwork and details? Custom millwork like wainscoting, coffered ceilings, hand-carved banisters and built-in cabinets used to be a standard feature of any home, but those traditions have fallen by the wayside with the rise of factory-made cabinets and other mass-produced installations. These new innovations may be less expensive, but they also lack the one of a kind custom millwork installation. Radiantly heated floors are not a new idea--in fact, they are a very old idea. The Roman method of heating the home (or heating the bath house) via a heat source under the floor was known as hypocaust. Today, the majority of residences and businesses are heated through hot air ducts or by radiators, but the idea of radiantly heated floors is taking off in some locations because of its many benefits.